Phase 2 DMVPN uses multipoint GRE tunnels on all routers. NHRP is used for dynamic spoke registrations (like with Phase 1 DMVPN), but also for on-demand resolution of spoke transport addresses. 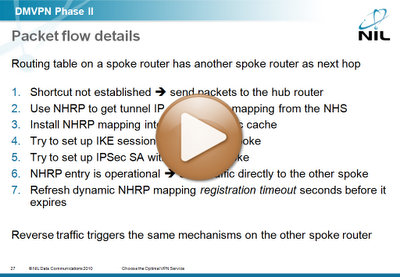 Traffic between the spokes initially flows through the hub router until NHRP resolves the remote spoke transport IP address and IKE establishes the IPSec session with it. The IP next-hop address for any prefix reachable over DMVPN must be the egress router (hub or spoke). From the routing perspective, Phase 2 DMVPN subnet should behave like a LAN. Multicast packets (including routing protocol hello packets and routing updates) are exchanged only between the hub and the spoke routers. Routing adjacencies are established only between the hub and the spoke routers unless you use statically-configured neighbors.